Note to dear customers of Kopack: Our trademark is Kopack. For old batch order reason. So few products may with other logo on it. Please just make sure you ordered from Kopack store. Then you get right product. 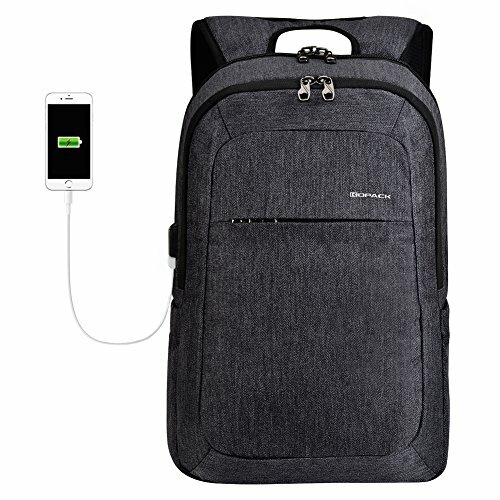 The Kopack gray black laptop backpack fits laptops with up to 15.6 inch screens offering an array of impressive features for staying organized and keeping items accessible and secure. External USB Interface:External USB with built-in charging cable offers convenient charging of your USB enabled electronic devices whether on a business or weekend trip. Multipurpose Daypacks is perfect for business trips or weekend getaways or for simply heading to the office or school and home again. 【Anti-theft Hidden Laptop Zone】 Want to keep private when pick laptop in public? Separated Laptop compartment behind straps design for you. Get laptop easily and keep rest in private. Zipper can be locked to D shape ring to keep laptop privacy. 【Detachable USB Cable】Built-in severe quality controlled USB charging port , easy to charge Smart phone without hassle to take out power bank . Better for cleaning backpack, wont get usb rotted, replacing the cable by removing the built-in cable. 【Anti Theft Dual Layer Zipper】 The anti-puncture 4 tooth zipper of the main compartment provides double anti-theft protection with lockable zipper provides super travel safety to you. Perfect for business trip/weekend getaway or heading to the office/school/home. 【Quality Material】 Upgraded fabric with excellent texture, featured with durable tear-resistant water resistant oxford for unexpected rain,wipe in 5 minutes, no mark left. High elasticity sponge padded shoulder straps and back offers extra back support and comfort. Great textured linning inside. If you have any questions about this product by kopack, contact us by completing and submitting the form below. If you are looking for a specif part number, please include it with your message. Pelican Products, Inc - Pelican Pelican 1490 Case W/ Pick N Pluck Foam Interior Black "Product Category: Accessories/Carrying Cases"